Changi Airport issued a statement saying that Terminal 2 remains closed and all T2 flights have been diverted to Terminal 3. All flights at T2 have been moved to Terminal 3 until further notice, CAG said in a post on its Facebook page at around 8.20pm. “Significant delays to departing and arriving flights at Changi Airport this evening” are expected, CAG added. Changi Airport’s Terminal 2 remains closed after it was evacuated earlier due to a fire, Changi Airport Group (CAG) said on Tuesday night (16 May). “Flight information is being updated and passengers should check the flight information screens in the terminal and on the Changi Airport website for check-in row, departure gate and baggage belt details,” said CAG, which apologises for the inconvenience caused. In an earlier Facebook post, CAG said a fire alarm in T2 had been activated at about 5.40pm due to “smoke coming through the air vents”. It added that the source of the fire had been identified and that the situation was under control. 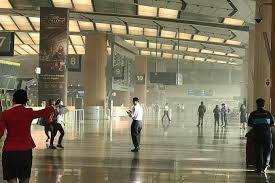 Another Facebook post by the Singapore Civil Defence Force said that a “small fire” that occurred in the departure area of Terminal 2 had been put out by its officers.